An Iraqi militia leader once branded a major security threat has appeared in public alongside Iraq's prime minister after being freed from US custody. Ahmed Shibani is a senior aide to radical Shia cleric Moqtada Sadr, whose political movement plays a key role in Iraq's power-sharing coalition. 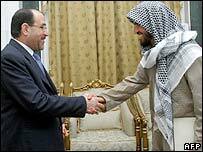 Mr Shibani met Nouri Maliki hours after Iraqi government officials said they were talking with insurgent groups. The US-led coalition said Mr Shibani could help moderate extremism in Iraq. In a statement, the coalition said leaders judged that Mr Shibani "could play a potentially important role in helping to moderate extremism and foster reconciliation in Iraq." Supporters of Moqtada Sadr clashed with a rival Shia militia group in the southern city of Basra, with reports of some casualties. The US military said it had arrested two brothers it blames for the capture and eventual killing of five US troops in the city of Karbala in January. Shortly after being freed from US custody on Wednesday, Mr Shibani was seen being photographed with Prime Minister Nouri Maliki, and was also interviewed on Iraqi TV. Iraqi news reports say negotiations for his release appear to have been carried out by the Iraqi government. Should Iraq talk to militants? The BBC's Hugh Sykes in Baghdad says this is a clear sign of government confidence in Moqtada Sadr and his followers in the Mehdi Army. The group has largely been co-operating with the Baghdad security plan imposed in mid-February. The US military jailed Mr Shibani at a military prison more than two years ago after detaining him during an uprising against the occupation in the Shia town of Najaf. At the time the US military described him as a major threat to Iraq's security. On Wednesday Saad Yousif al-Muttalibi, of Iraq's Ministry of National Dialogue and Reconciliation, said the government was talking to a range of insurgent groups. And Vice-President Tareq al-Hashemi told the BBC there was no option but to hold talks with all armed groups, with the exception of Iraq's al-Qaeda movement.